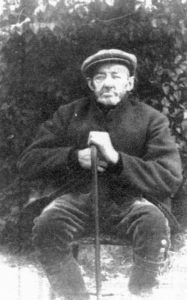 John Isaac Sentence was born in Barrowby in 1837. He married Mary Horton in 1857. He worked as a shepherd and they lived in Ossington and Hawton before settling in Shelton. They had 16 children; the youngest son (or possibly grandson) Fred, was born in Cotham in 1888. Before the war Fred Sentance served for 7 years with 1st Battalion Sherwood Foresters in India. By 1914 he’d left the Army and was living in Bennington Fields, Cotham with his sister Fannie Seward (she married Charles Seward in 1886). When war broke out he was called up as a reservist and joined 2nd Battalion of his regiment. Around midday on 31st March 1915 Fred (now a Cpl) was shot in the head by a German sniper and later died (age 27). He was buried at Cite Bonjean Military Cemetery, Armentieres.